Do you find yourself asking “Whose life is it anyway?” Parenting today has come to resemble a relentless to-d- list. 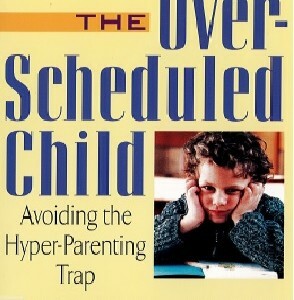 Even parents with the best intentions strive to micro-mange every detail of their kids’ lives schedules, meetings and appointments invade our every moment, and the need to be the best dominates-and undermines-our own sense of self as well as our children’s. 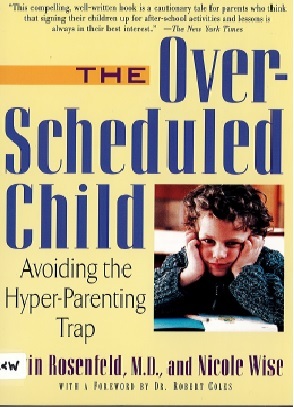 In this groundbreaking new book, renowned child psychiatrist Alvin Rosenfeld, M.D.. and longtime family-issues journalist Nicole Wise combine personal and professional experience to take action against what they see as our overeager pursuit of perfection. The clear, comforting steps they prescribe to attack this rampant phenomenon will promote healthier and happier children and revitalize the parenting experience.